Yikes! I almost missed it. But it's still the 22nd, so I'm not too late yet. As usual, Fall Into reading is being hosted at Callapidder Days. It's become a tradition by now, so of course I'm in :-) The challenge is to make a list of books to read between September 22nd and December 21st. There is no requirements as to the length of the list, but I usually do a book per week. With the business of moving coming up, I think I'll go a bit easier on myself this year though, and just take 10 books rather than the usual 13. So far this year I've read 130 books. That's a bit less than my usual, so I doubt I'll make it to 200 like I have on previous years. However, my sub-goal was to read 50 books from my to-read shelves, and there I'm at 40, so finishing that should be very doable. For the same reason, all 10 books on my Fall Into Reading list come from my to-be-read shelves. Happier at Home - Gretchen Rubin Can't wait to read this! Call the Midwife - Jennifer Worth Independently of each other, Nina and I both bought this book on our last trip to London. She's already read it and liked it, so I figured I'd better catch up with her. Somebody Else's Kids - Torey Hayden I've yet to read a book by Torey Hayden that wasn't WELL worth reading. Border Wedding - Amanda Scott This has been on my shelves longer than I care to admit. I have NO clue why I haven't gotten around to reading it yet! Lightning - Dean Koontz I went on a Koontz/King kick several years back thanks to Carina. She had two copies of Lightning so kindly gave me one of them. For some reason I've just never gotten around to reading it. The Magician's Apprentice - Trudi Canavan Another book that I do NOT understand has been standing untouched on my shelves for so long. I absolutely loved the Black Magician Trilogy, so why haven't I read this prequel yet? About time! Wow, you are quite the prolific reader! 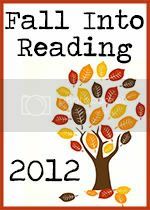 Happy fall reading! Oh my goodness -- 130 books so far this year? I am seriously impressed! So glad you think of Fall Into Reading as a tradition. Reading traditions are one of the best kinds. :) Thanks for being part of FIR '12. Enjoy your fall reading! Cool list! I am very impressed by your totals, even though you say they are lower than normal. Happy reading! I'd really like to read one of Jenny Colgan's novels this autumn too, for a bit of foodie light relief. Snuggling up with a cuppa and some cake, reading a good book, sounds like my perfect cold-weather day off! My friend bought me 'Meet Me at the Cupcake Cafe' for my birthday last year, and 'Welcome to Rosie Hopkins' Sweetshop of Dreams' this year, so I reckon it's time to finally read them! Wow 130 books is a huge total. Hope you manage to get a few more in today during readathon.